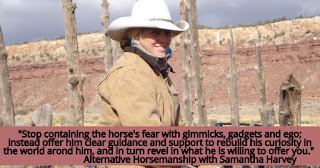 Sam's ideas, philosophies and horse training theories have developed over 25 years of working with a variety of riders, disciplines and breeds. 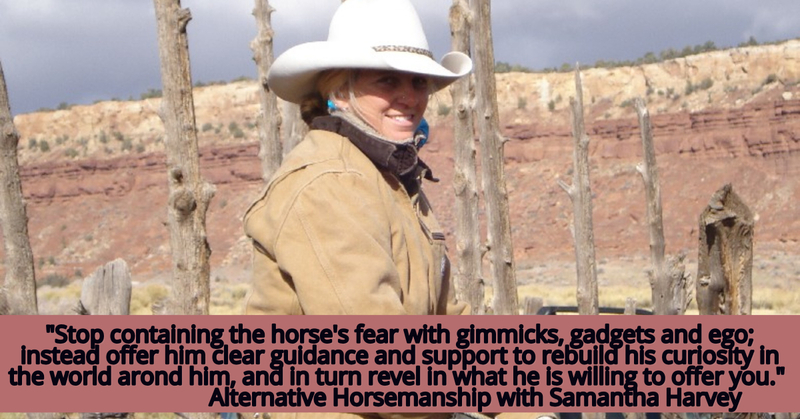 She addresses dangerous and unwanted horse behavior, fearful riders, competitive mental strategies, Alternative Horsemanship, Horse Webinars, is a Remote Horse Coach and consultant and offers limited Clinics worldwide. 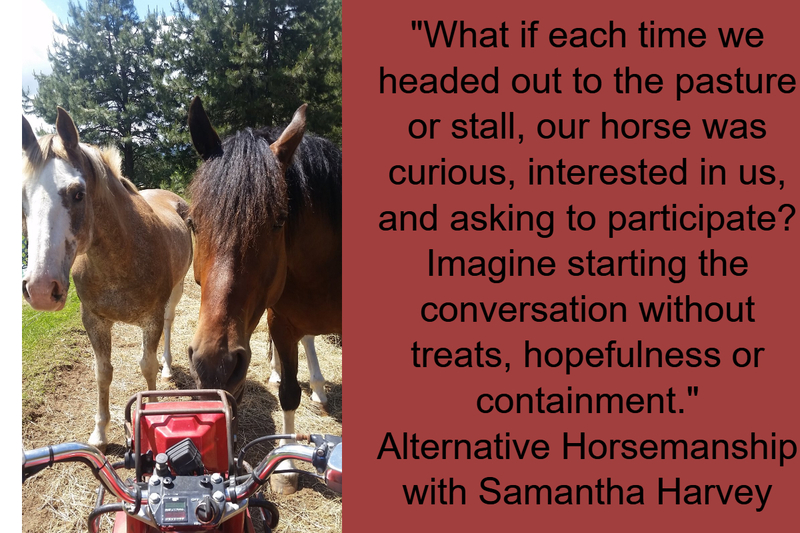 Enjoy the blog entries as a preface to work with Sam as your remote horse coach or participate in her group webinars! For most folks they do not rely on their horse for their livelihood and therefore lack a perspective of what kind of quality partner they could have and would need, if their life literally depended on their horse. The picture I have included was taken from time I spent on the north rim of the Grand Canyon. Besides the modern day truck and trailer, much of the day to day life was just as it was 100 years ago, including staying in cabins with no water or electricity 40 miles from the closes paved road. If you notice the dogs in the back of the truck with us women and kids, we'd drive out into remote country, and the dogs would bail off the truck as soon as the got scent of the wild cattle that only saw humans once a year. We'd slam on the breaks, unload horses, and ride hard through the high desert to catch up to wherever the amazing catahoulas would be holding a group of wild cows. Never before had I experienced a true appreciation of why all the "details" mattered in my partnership with the horse. From there, with no fencing, we'd have to sort, tag, doctor, etc. There were many unexpected scenarios and it was a constant challenge of adaptability, with no "pause button." But the common horse owner will never have that experience or exposure in educating themselves or their horses, and yet their conversation and partnership with their horse is just as important. Too many times I’ve encountered horses that have been forced through the “school of hard knocks” training theories- whatever situations they had “survived” equaled to the description of being an “experienced” horse. The idea for this post came as I was thinking back to last summer when I was working with a three year old mare I was starting. 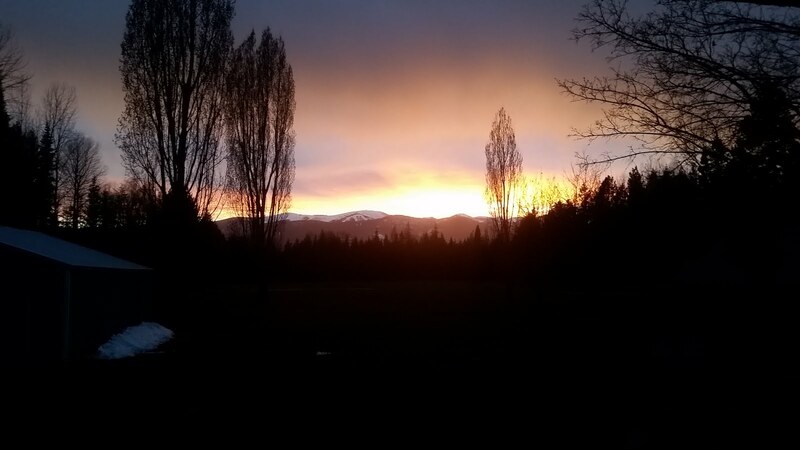 Those of us in the northwest had been experiencing quite the rainy season with two weeks almost nonstop rain, wind, hail and snow up in the mountains. Not exactly ideal conditions neither for starting a youngster, nor for me, who prefers my winters spent in the desert warmth. But without other options, one must continue. Many times owners are shocked at the changes in demeanor, personality, confidence, etc. in their horse after a few weeks spent with me. Part of the change they are seeing comes from my prioritizing spending quality time with the horse and to focus on creating confidence building, thoughtful, experiences every time I work with them. I also always try to mesh “reality” with my horse training. It does not matter to me what long term discipline or direction the horse may be destined for. For me, I want all horses that I work with to have a solid foundation. I always say I want my jumping horses to be able to chase a cow, and my ranch horse to be able to pop over a fallen log on the trail. Basically the underlying theory of all that I attempt to do with horses is to create a mental availability to “try” no matter what scenario I may present for the horse. If the horse can mentally address what is being presented, eventually physically they will comply with what is being asked of him, without the stress, trauma and drama that is more typical when someone just tries to manhandle a horse through a situation. So back to the young mare, bad weather and using reality to build quality experiences for her. 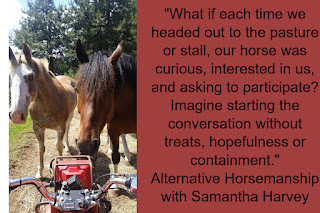 I want to make clear that I’m NOT suggesting that you go out and try some of the things I’ll mention below, but this is to help expand your thinking for really could be possible when you work with your horse. I also want to mention that there were many pieces of the “puzzle” I had to present to the horse before I did any of the following with her in order to create clear communication with both physical and spatial pressure, respect of personal space, and being able to direct her thought to something specific. Without that clear communication established FIRST, the rest of what I presented to her would have been done with a “hopeful” feeling in me and challenging her, rather than a “supporting her”. With all of the windstorms I had a continuous flow of dead limbs falling off of trees in the pasture. After proper preparation of teaching the horse to think through and physically participate to pressure, ropes around her body and legs, etc. I then used her to drag out the fallen limbs to wherever I needed them. Rock clean-up time the arenas was another great “learning” experience for a young horse. Giving them the job of following you around as you’re “focused” on finding the rocks, plus throwing the rocks to the edges of the arena, can teach the horse to learn to wait, and also realize chaos around them, has nothing to do with them, therefore they do not need to "get involved" with it. This came from sudden movement of the rock without the energy being directed towards the horse. If I had to run to the far end of the property to fix fence I’d pony her or just have her follow me and “hang out” while I fix fence. When she was “just standing there” she’s not allowed to eat, focus on the other horses, etc. Rather it was a great opportunity for her to learn how to stand quietly, patiently and wait for me. As was moving hoses to different waterers, I used the hose dragging on the ground around her feet as another scenario to teach her to be aware of her surroundings, but not defensive towards them. Instead, be curious, without the fear. 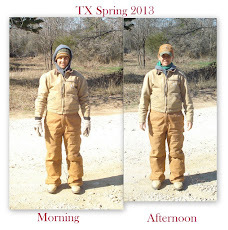 As I fixed the hay tarps, her job was to focus on the noise and movement of the tarp flapping, crinkling, etc. As I rode through my woods on a more experienced horse to cut small overgrown branches on my trails (done from horse back- no I don’t suggest this to just anyone) I ponied the young horse so she gets used to noise above her head, the movement of the falling branches, and can pick up on the vibe from the confident horse I’m riding. At the same time I'd usually have two dogs and a few cats or more with me to "help her" with being interested rather than being fixated on sudden movement from them “popping out” of the woods and running in front, behind, or next to her feet. One of the hardest parts in working with a horse is staying creative enough to keep each session interesting. Depending on your facilities you may have to spend some time creating obstacles or ways of presenting scenarios with variation. Too many times the horse and handler can fall easily into the routine or “patternized” behavior. This creates the false illusion that the horse is doing “well”- until a new scenario or one that is altered from what the horse is used to has been presented. Then the “real” feelings of what the horse has been carrying around come to the surface. A lot of people and horses become really comfortable with what they know and do not like change. The problem is the day you don’t have an option and must present a change from the “norm” you’ve then opened a whole new can of worms with your horse and its usually not the time for a “training” session. But remember, the task is great to give the human direction and intention, but the CONVERSATION is what allows the task to be accomplished with quality. There is not point is focusing on hurrying, bullying or dominating a horse through a task, if it decreases the horse trust and confidence. If instead you can prepare both you and your horse to view any situation as one to expand their experience, exposure and confidence you’ll be building a solid, trusting partnership for the long term. With this mentality you many not seem to “accomplish” as much as “fast” as someone else, but don’t worry about keeping up with what other horse people are doing. Go with your instinct and do what is best for you and your horse. Both of you will be happier in the long run. Whether you are a trail rider, a weekly "lesson" participant, or a die-hard clinic auditor/participant you can get MORE out of your time, effort, and money spent by keeping a riding journal. Now, hold on and don't sigh yet... I'm not recommending a "write everything that was said or learned" journal. Instead think of it more as something to highlight 3 focus points from your session. Don't focus on the big or obvious things and don't write your opinion such as "I like that my horse..." Write your entries from a neutral perspective rather than an emotional one and jot several focus points that you worked on with your horse. The sooner you can make your entry after your ride the more accurate it will be. "Life" can happen and even just a day or two later you'll forget a lot of what you had noticed during your last session with your horse. You may want to include: what, when and how you asked something of your horse. Then observe the level of his participation mentally, emotionally and physically to your communication. You'll find his physical participation will be a reflection of his mental and emotional availability towards you. Many times we think we "know" our horses, but all too often the little details escape us. Once you start to make it a point to raise your level of awareness when working with your horse, you'll find that you'll also start to "learn" a lot more about both yourself and your four legged partner. •How long into a session when working your horse either from the ground or when riding does it take for him to sigh, like his lips or blow his nose? •Is he "patternized" and require a "routine warm up" or is he mentally available to address whatever you offer whenever you might present it? •Does he "always" respond in the same manner when you ask a specific task of him? •Evaluate yourself when you present one specific task for your horse. What did you learn about you? How, when, and why did you do what you did? What are other ways you might be able to communicate the same desired result using different aids? Health Wise- if you notice odd physical behavior (coughing, runny nose/eyes, soft stool, etc.) make a note of it. A lot of times it can help prevent or diagnose an on-coming health issue. Keep track of worming, vaccinations, shoeing, etc. and notice if there's a correspondence to a change in your horse's health. Lameness- if you start to notice your horse becoming sore after a certain type of workout you might be able to "break down" what is causing this and prevent any long term damage. Learn from the past- REVIEW past entries in your journal once month. You'll be amazed at how fast your level of awareness and sensitivity increases once you make a point of noticing the small details. You'll also be amazed at how much you "thought you knew" but then had forgotten as you advanced on. It's always a good idea to go back and review the basics no matter what level rider or horse you have. Question: What does crossing water, jumping a fence, making an accurate turn on a gaming course, asking for a flying lead change, trail riding, and turning back a cow all have in common? The horse’s brain. Question: What does a horse refusing or kicking out when asked to move forward such as at the canter or lope, spooking, herd anxiety or herd bound, trailer loading issues, bolting, “leaning” on the bit, becoming aggressive, fidgeting when tied, a horse that won’t stand quietly to be mounted have in common? The horse’s brain. Lack of Awareness: So many times the person does not recognize, put value to or address their horse’s behavior until it gets dramatic enough that it no longer can be ignored. The horse does not randomly acting out. If a person is reacting after a horse is at their peak stress level, the horse is not being supported by them, and is on their own as to how they handle themself. Lack of Understanding: Have you ever seen the magician move the three cups around with one cup covering a small ball? The object is for you to try and visually follow the cup shielding the ball. The distraction of the movement tends to confuse the person watching and they usually pick the wrong cup at the end. The same goes for horses. People tend to focus on the “big” and “dramatic” movement instead of watching or noticing the small ways their horse is constantly communicating with them. Focusing on the unwanted horse behavior rather than reviewing what led up to the unwanted moment. A lack of understanding regarding the root cause, makes efforts from the rider attempting to “fix the problem” seem futile. Lack of Clear Communication: If you spoke English and were attempting to communicate with someone who only spoke Italian, it would not matter how many times you repeated yourself, how loudly you spoke or how much you changed your tone of voice; they still would not understand you. This often is the case between human and horse communication. First the rider’s manner of communicating, using their energy or aids may have no meaning to the horse. So the horse appears to “ignore” them because of a lack of understanding, causing frustration in the rider. Using “stronger” aids (harsher bit, longer spurs, whips, etc.) is often suggested, and yet frequently this does not clarify the communication. The seemingly random use of aids, with increasing severity, offering critique can cause the horse to become mentally tuned out as a coping mechanism. Lack of Mental Availability: If you have ever been asked to do something that you did not want to or did not understand, can you remember the feelings of physical resistance in your body because of the mental stress you were experiencing? Without the horse mentally participating “surviving the ride” and being “hopeful” for an uneventful ride becomes the norm in the rider. Neither of which will make either horse or rider come away with a positive and motivated feeling for the next ride. How many times have you witnessed or experienced a “difficult” or resistant horse and stopped to notice where his brain was? Have you ever watched a horse resistant to load into a horse trailer? Have you seen him looking in the opposite direction from the trailer? How will he load with quality if he is avoiding thinking or literally looking at the trailer? Have you ever tried to turn left and had your horse “leak out” to the right? Notice where his eyes are looking? Towards the right, which is why his body is leaking out in that direction. Since the horse’s body follows where his brain is at, he’ll never make a quality and balanced left turn if he isn’t thinking about turning left. Have you ever felt your horse “shift gears” and noticed you were passive, or hopeful, that he’d slow down? Until that horse thinks about slowing down, he will not offer a soft and thoughtful physical response. Have you ever been riding in a group and gone to leave the group and had your horse have a complete emotional melt down and physical tantrum? 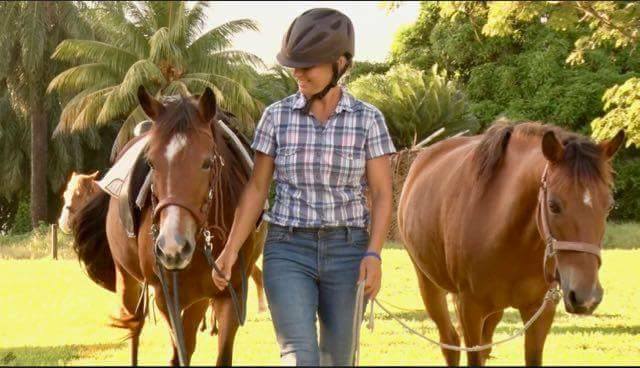 Until you horse can keep his thoughts with you, irrelevant if you are near the other group of riders or not, his brain will remain with the group of horses that left and therefore his body will try to follow his brain to get to back to that group. I’ll close with mentioning another key “tool” missing from most horse/people partnerships is quality. Too many times it’s not until “the day you need to get the job done,” that people suddenly and randomly demands quality from their horse. Don’t wait until the moment you need to get the job done as the first time you ask for quality from your horse. Every day, every moment you interact with your horse. If you’re not offering it, don’t “hope” for it from your horse. If there is a lack of confidence, understanding or clarity the horse won’t/can’t do his job well. Would like a to have a private one-on-one consultation with Sam? Now you can with her REMOTE COACHING option! 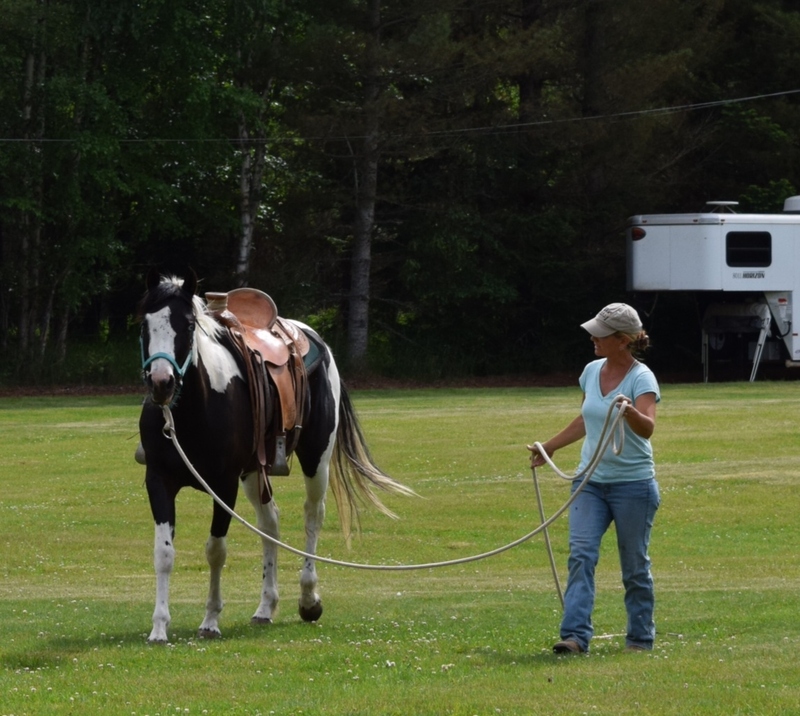 How do you know when a green horse is ready to ride out on the trail with a timid rider? This is a common questions for a lot of folks, feeling a bit of "Are we ready yet?" moments. So I'm going to break down riding out like a baking recipe. First, do you you have all the necessary ingredients? This means do you have effective "tools" in your communication? Can you influence your horse's thought before his movement? Can you interrupt him fixating on something when he is distracted or unsure? Can you regulate varying degrees of energy within each gait? Does your horse feel quiet at the halt, or does he feel like the halt is containment and as you let him walk out from it, does he rush off? How specific can you be/have you offered in your direction of the path he will move on? Can you offer him to do something other than "move out straight," (circles, turns around the tree, rock, etc. that are thoughtful and soft vs obedient,)? Can you work around different places at your barn/pasture/home facility and have him interested, or do you notice you feel his heart rate increase under the saddle and his breathing become short and raspy or dragon like, and he starts looking for the other horses? Next, we have to "mix" the ingredients. At all properties there is usually a safer zone and an imaginary boundary where the horse becomes a bit unsure. Use this opportunity not to "make" the horse tolerate the uncomfortable place, but rather help him think through it. This means giving short, specific, direct communication and breaking down the big "let's ride through this spot tolerating it and feeling uncomfortable," to instead, small, intentional, soft pieces where he learns to think through his worry, rather than flee from it. Eventually you'll be able to link the pieces together and ride "through" with it concerning your horse. This is NOT repetitiously practicing riding back and forth, back and forth, in a scary area to get your horse "used to" a specific location. That approach does not offer confidence for the unexpected moments and things that can arise on the trail that you may not get to "practice," such as when the moose jumps out. The horse should become more relaxed for your efforts in helping him through an area that bothers him. If he isn't letting down the tension in his body, concern in his brain, softness in his response to you, then something has been missed and you'll have to go back and revisit the quality of your ingredients. What about the rider's confidence? Learn how to take the pressure off of yourself. The timid/unsure rider comes from a place of feeling "surprised" by what the horse does, or feeling ineffective towards their horse. 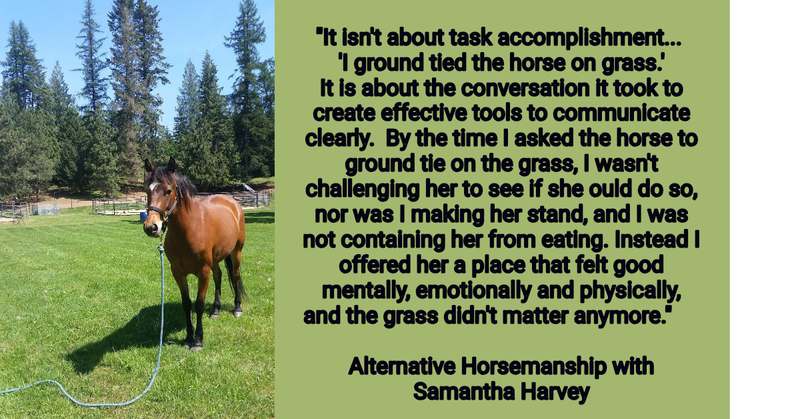 So, I want you to learn how to practice assessing and having mental conversations (without your horse in hand,) allowing you the time to think through various scenarios. I want you start to think back and learn from the past, to moments when you started to see behaviors in your horse that were concerning. Then think through, how your horse "handled it" and what you your communication was towards your horse. Then assess how early did you recognize those behaviors (which are a reflection of the horse's brain and emotions) and if you were "hopeful" that your horse would just let it go on his own, or the passive rider trait. This is a vicious cycle that occurs with timid/fearful riders. And no, horse's cannot rationalize if the way they are choosing to do something isn't safe, therefor the human needs to interject. But this is where fear in the rider comes in. If you don't have quality ingredients, such as being able to ask your horse's brain and body to pause, or stop, and check in with you, then you will typically not offer a "boundary" for fear of an over reaction from your horse. And of course not wanting to have a "blow up" during the moment of peak stress. 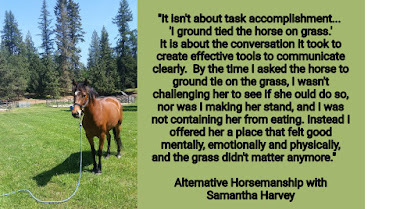 That is why it is so crucial to have a mental availability, or willingness, for your horse to hear you, and offer a "try" in whatever you've asked of him, BEFORE you present a location that could potential cause him to be unsure. The time to "fix" your tools is not at the time of peak stress. 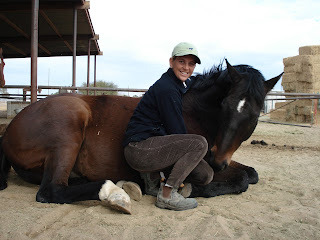 So, since hind sight is 20/20, I want you to think about times your horse was starting to show concern, such as when you START to feel him getting looky, walking a bit faster, not quite as responsive to an aid, and I want you to talk yourself through your options of how you could communicate with him in order to influence a change in his BRAIN first, that will result in a different behavior from him. The earlier you influence a change in thought, the faster he will diffuse his worry or concern, therefor you've "drained" his cup from overfilling. This conversation is not about critiquing the horse for what he is doing, he is honestly telling your his concern, so if all you do is tell him "no" it does not help him. But if you offer a "not that, but how about this?," re-directing his thought and focus, it is offering a positive alternative, or a "way out" from his mental discomfort. The other huge factor is most folks shut down, or quit communicating, at the time the horse needs them the most. Learn what your own triggers are when you go passive in the saddle, and come up with ideas for yourself to "try out" that can keep you mentally present and offering conversation with your horse. 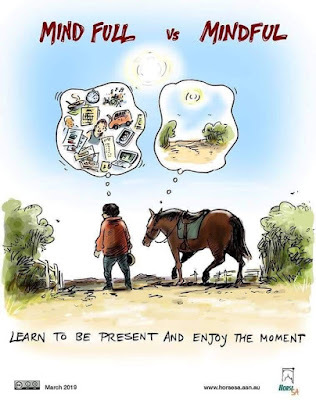 The more you learn to stay present in the moment with your horse, the more supported he will feel, and he will gain confidence, offering softer and more willing responses, which in turn builds your own confidence. How does this all tie together for riding out? Once you have the ingredients, have done your own mental preparations, practiced using quality communication to work through your horse's bother, or you've now mixed the ingredients, you are ready to "bake." Just as with cooking, even if you have the correct amount of everything mixed together, if you leave the batter in the oven too long, it gets burnt or overdone. For green horses and insecure riders, this is such a frequent occurrence. 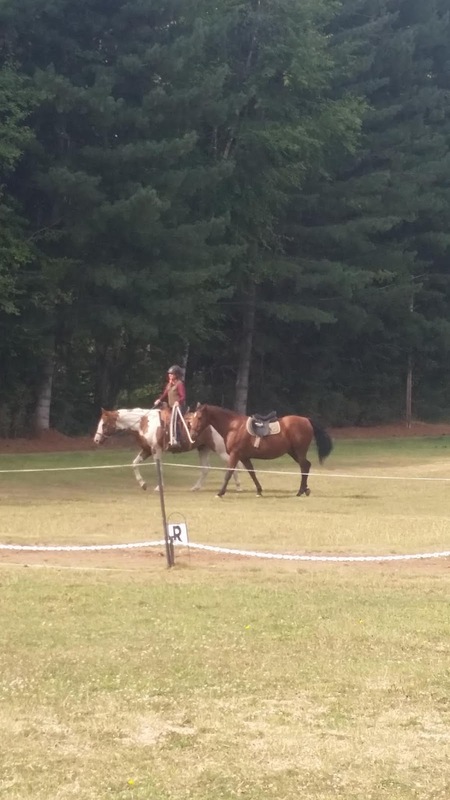 They have this idea that "trail riding" needs to be a certain distance, or amount of time, and they tend to "over do" or burn out mentally, because it was initially too long mentally for the horse and rider. So the initial trail ride(s), might be to the mailbox at the end of the driveway and back. Or a hack around half the property. 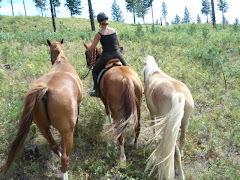 The horse does not have the ability to decipher between what is a "real" trail ride and that which is not. That comes from human's judgement and the horse world's standard. But who cares about all that? Because really what is the goal? To expand you and your horse's confidence and ability to ride out into the real world, and be better mentally and emotionally for the experience. So think of it like the competition arena. You don't show up to the show without practicing, right? So don't head out on the three hour ride without practicing in incremental, quality shorter rides. So how do you know when you've baked your ingredients and you get the desired end result? Your horse will tell you. When whatever conversation you present feels soft and willing, when he gets distracted but can let it go when you ask him to re-focus without him getting defensive, when you can communicate without feeling mentally and physically exhausted after 15 minutes (part of which comes from folks not remembering to breath as they are attempting to help their horse.) And really, you'll feel the fear or unsureness in the horse diminish and his curiosity (different from fixation) perk up. He's telling you, with your support, he's ready to take on the world and ride out. Would you like the opportunity to work with Sam? Find out about Full Immersion Clinics, Private Clinics, Remote Coaching, and more! Question: How do I feel about positive reinforcement with horses? First if you ask a group of people what positive reinforcement means to them, they will give you answers varying from clicker training to offering treats as a reward, etc. so let me share my alternative perspective on this. I've recently had several clients on the hunt for prospective young horses, which has brought up many conversations about dynamics in horse behavior and herd balance. Folks nowadays rarely get to see "horses being horses," and unfortunately many horses have limited social experiences as youngsters, which can greatly affect how they mature, their confidence and their curiosity in the world around them. If you have the opportunity to watch horses together, you'll start to realize how much CONSTANT support they get from other herd members. It isn't just about the lead mare running the herd, but each horse has something to contribute, and there is a continual conversation, or support, that is occurring among herd members. Now let's think of the human/horse dynamic and conversation between the two of them. People frequently assume the horse will "be okay" in a human's world. And though the horse has the amazing skill to adapt and participate in things completely foreign and unnatural to them, there needs to be a foundation of clear and specific conversations built upon one another, so that the horse can succeed in the human's world. So how do we have a conversation with the horse? The most natural way is through the concept of pressure and release. Unfortunately in human terms, we think of pressure as a negative thing as in, "work pressures, family pressures, etc." But to horses, pressure makes sense. It is how they communicate with one another, whether through spatial or physical pressure. So the challenge is first for the human to recognize what pressure even is to the horse. You can create pressure from 100' away or from how you are touching your horse. The challenge is for you to be able to read the horse's feedback as you present pressure, and learn to recognize when he is showing defensiveness, concern, fear, feeling relaxed, or curious about it. That feedback tells you what things are creating bother in the horse and what you need to address so the horse is not feeling concerned through your pressures and attempt at communicating. Pressure should and can be used to guide, to support and help the horse, if he is not defensive towards it. It is so crucial that your "tools" for communicating do not make the horse weary. That is why when you walk in to the stall and go to halter and your horse looks away from you, or you attempt to lead and the horse drags on the rope, or you go to mount and the horse moves away, matters. It is all feedback from the horse telling you that he is uncomfortable with the pressure. If that level of pressure causes concern in the horse, how does he feel about all the pressures that will follow as you to attempt to communicate? So, for every horse various types of "pressure" can feel different, so the "release" is going to be different. To me, the release of pressure, whether spatial or physical, is a thank you, or positive reinforcement. Most folks, rarely offer a release, as they don't realize how much pressure they are continually imposing on the horse. In the beginning of the horse's learning with the human, things like the "halt," typically thought of as a command, though I perceive it as a release, or a positive reinforcement, if it allows the horse to mentally, physically and emotionally relax. From the halt starting as the initial positive reinforcement, as a horse's education evolves, his experiences will expand in what makes him feel emotionally quiet. Things like walking out- soft and thoughtful, standing in the stream, playing "games" and searching out the soccer ball, etc. can all start to feel like the release, or positive reinforcement. There is no one "behavior" that should feel like the positive reinforcement from the human towards the horse. The world around us is continually changing and the horse needs to feel confidence in being adaptable and feel positive reinforcement from the rider for his willing and soft thoughtful participation, rather than offering patternized, conditioned responses. The release can come in any shape or form, and if it offers a positive feeling in the horse, I see it as positive reinforcement. So for me the more thoughtful, present, and participative the horse is to have a conversation, the better the horse feels, the more willing he is to participate, the more his time with me feels like a "positive reinforcement," or support, similar to what he would receive from being in the herd. I think the above quote is so true when it comes to our own personal journey of Horsemanship. Lately I've been working on putting together projects and have been including interviews from students past and present. None of the students heard each other's answers to three simple questions about their learning experiences with me. Yet there was a consistency in how they evolved in their own personal growth from our sessions working together. Most commented on realizing that at some point, they had reached a mental shift in their approach and Horsemanship from their initial, "I want," to the supportive, "What my horse needs..." This created such an availability in themselves, that they then could see and hear their horse without judgement, in turn leading to emotionally satisfying experiences with their equine partners. It is VERY hard in today's extremely critical society, including the equine world, to be able to have the courage to create your own journey for you and your horse. What may work for one person and their horse, may not work for you. What may work with one of your horse's may not work with another horse of yours. What may work with your horse on one day, may not work the next. Someone else may have more talent, skill or riding history, but it is irrelevant to your own journey. Whether you have the "fanciest" horse in the barn, or someone's unwanted rescue, the future is unknown, and there are no guarantees. Some horses, just as with people, can come into your life for a short time, or their entire life time, and we never know what will come in the potential joys and heartbreaking twists and turns that we may experience with them. But if every moment we spend with them, we prioritize that we are mentally present, emotionally available and physically quiet, we can learn to appreciate the littlest tries, the quality moments and the connection where it seems we have become one for a precious time. I think we all can agree the euphoria one feels after a particularly "connected moment" with our horse can last for hours or days... and it makes all of the other effort and energy worth it! So the next time you head out to your horse, be sure to check in with yourself for a moment, and offer the best possible version of you for your horse! This describes a horse who is mentality unavailable to hear the human; frequently referred to as one that is "shut down, dull, dead sided, lazy, heavy or leaning on the bit, bombproof, kid proof, husband proof, etc." 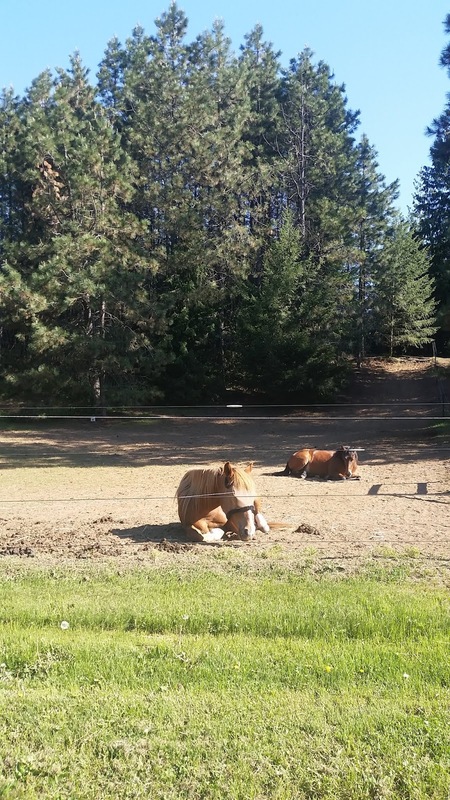 The misnomers come from a person's misinterpretation of the outwardly slow and "quiet" behavior, thinking this is a reflection of the horse being okay with life. The overly lethargic movement, postures and responses can actually be a build of emotions brewing inside that have been contained; until the day the human unintentionally presents something unexpected, and then the horse "suddenly" gets dramatic in letting out those pent up emotions and stress. Tucking the chin towards the chest to create slack in the rein, or evade the pressure of the lead rope, rein, etc. bit, but still moving in rigid, short steps. Looking in the opposite direction from where something is bothering the horse or quietly fixating elsewhere to mentally avoid pressure (induced by the human's presence, activity, or anticipation of what might be asked of him,) while physically standing still. The horse getting "stuck" on an idea; he offers only one behavior or response towards the human, becoming more and more bothered as he is asked to offer a different response. The horse that you feel like you have to keep "starting over" with after you have previously presented something. The horse that "always does ___________________..." in the same place, location on the ride, time in the ride, etc. The horse whose response is to "do less" the more you attempt to communicate. The horse that "goes through the motions" without being mentally present; great example is the lesson horse that learns the pattern, the dude horse that knows which tree you turn at to head towards home at, etc. I posted this picture of a horse avoiding as a visual example. If I asked what is the horse doing? Most people would say, "Standing in the tire cutout and with the pressure of the blanket on the ground underneath him." Their answer would be looking at the horse's physical lack of foot movement. But what if we look at the emptiness in his eyes, the tightness of his ears, the locked up posture of his knees, the bulge in his rib cage... He is obediently standing there, but nothing about this moment has him feeling good. Now, how would the information from those assessments affect what you present to him next? Your evaluation would "tell" you that instead of saying "yeah he accomplished the task, let's move one," that instead you say, "Wait a minute. I need to help him take an interest in what we're doing, rather than tolerating it. How can I mentally engage his brain to focus on what we are doing, rather than physically standing in the tire, all the while mentally avoiding it." This change in our interpretation of what we actually look at and see in the horse, can improve everything in how we approach our horsemanship. The next time you head out to drive your car, sit at the dining table, sit in the office, stand in the elevator or move in general, I want you to check in with your physical movement and posture. If you turn left while driving the car, do you find yourself rocking in your seat and leaning towards the left as you turn? If you are sitting on a hard surfaced chair, are you sitting equally on your seat bones (do you know what those are?) or are you sitting at an angle with your legs crossed? If you are standing, do you lock up your knees, stand with more weight on one foot than the other, or compensate for discomfort by leaning against something? "Heels down, hands up, don't lean forward, head up, etc." Unfortunately, most instructors are unable to "link" how an unwanted posture is typically not the "issue" but rather the symptom of a deep issue, such as a lack of stable foundation in one's seat. This isn't about riding "pretty." 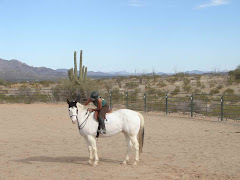 This is about the rider learning to be centered and balanced in the saddle so they can offer specific and independent aids when they communicate with their horse. The positions that are critiqued by instructors are the rider's unintentional way of compensating because they aren't balanced in the saddle. 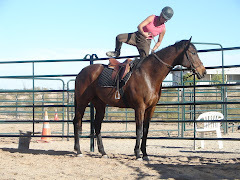 In turn the unwanted positions tend to also give the horse unintended "instruction." So now you have an unbalanced rider and a horse that is receiving a continual array of pressure through the rider's inconsistent aids. Whether you're a trail rider, competitive in western or English disciplines, or do a little of everything, your stability matters for safety, clear communication and quality ride time. But how much of the day do you get to spend in the saddle? Probably little. And if the only the time you think about "where" your body is at is when you are in the saddle, there are too many other things that are probably also going on in your mind that you will be unable to make needed adjustments. So I suggest first assessing your own postures, habits, and tendencies, (without critique,) when you are WITHOUT the horse. Start to bring awareness and intention to how you "hold" your body and experiment with making little adjustments. 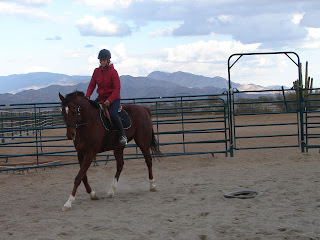 The more aware an adaptable you are without the horse, the easier it is to realign yourself and learn to find a centered spot while sitting in the saddle. Remember it takes gentle persistence and follow-through on your part to erase muscle memory from unwanted postures, and it takes effort and intention to make little adjustments. The more this thoughtfulness in regards to your body becomes part of your daily behavior, the less overwhelming it seems like to make adjustments when sitting in the saddle. When we say "horse" the initial image in our mind is that of the horse galloping through a field, or some other majestic movement. But there's also the aspect of thinking about how comfortable mentally and emotionally the horse is. 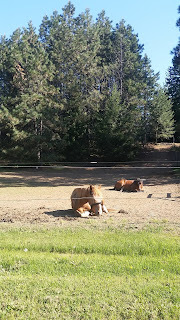 Many mornings after breakfast around 10 am as I'm working horses I notice those still in the pasture tend to lay down and enjoy a mid morning snooze. Although it may seem "cute," it is crucial feedback as to the horse's level of comfort and feeling safe. Even more feedback as to the horse's level of comfort can be experienced when you head into the pasture while the horse is sleeping; if the horse can acknowledge your presence, without re-actively bouncing up from his lying down position, he is not feeling defensive towards your spatial presence. In some of the extreme behavioral issues, one of the things on my checklist is to assess if the horse is actually getting enough QUALITY "sleep" time. There are many horses that are so bothered and worried, that they literally cannot let down emotionally enough to physically lie down. Although horses can sleep while standing up, to reach a REM state, they must lie down. So perhaps if you have access or the opportunity to watch your horse sleep, think about when, how long or even if you see him lie down. It could be a missing factor in your horse's health if he is always uneasy, hyper alert, highly reactive horse. Lightness versus softness... I still remember the day that my sense of "accomplishment" with a particularly troubled horse became completely shattered, and it changed my world and horsemanship skills for the better. This horse had already forced me to get as creative as possible, become open minded, refine my sensitivity, adapt how and what I was presenting, and we were making progress from his initially over the top, amazing, out-of-control athleticism he would display when he was having a problem. I had sought out help of a long respected cowboy whose words unfortunately never did match his physical abilities with horses, and so I came to him to watch and learn. His eyes lit up when he saw this bothered horse, not out of a challenge, but out of the opportunity to help a very bothered equine. I had tried to offer as much honesty in my interpretation as to what I had presented to the horse, how I had done so, etc. But my words fell on deaf ears, because the horse was already telling him the real story that mattered, what the horse needed in that moment, irrelevant of my efforts. What he saw, as he gently took a hold of the lead rope just using his thumb and index finger, was something I couldn't see at the time. My horse had been standing totally still, "quiet." The lead rope had been dangling and the horse had his focus on us. As the horseman stood in a relaxed pasture, and began closing his remaining fingers around the rope, with his hand just under the horse's jaw, the horse's head shot straight up in the air and he went flying backwards as if he had been "hit" by something. I was totally shocked. There was no pull, directing, or "asking" of anything by the cowboy. Instead all he had done was created a slight feel, or pressure, on the rope and the horse had given a pretty loud and clear response as to how he felt about pressure. So for all the light circles the horse could make around me all the while keeping slack in the rope, for as "with me" as he was when he was loose seeming to follow willingly, when I presented things with a direct physical pressure- he'd learned how to brace his entire body- WHILE- keeping slack in the rope, but he was never mentally or physically soft. This lack of softness would become apparent when I would ask more of him, which would trigger the brace that would quickly lead to an explosion- because really, it had been in there the whole time. There had been defensiveness in his brain and rigidity in his body, even though most of the time he wasn't ever physically pulling on the rope or the rein. One of the biggest challenges I have nowadays is teaching people how to decipher the difference between an obediently but defensive "light" feeling horse and a truly mentally and physically soft one. Thought for the day... goals are good, they give people somewhere to direct their own focus. BUT without having the quality tools to accomplish or work towards the goal with a softness rather than lightness, even if your horse accomplishes the task, does he feel better for the experience? Have you ever considered there is a difference? What do you feel you have with your horse? 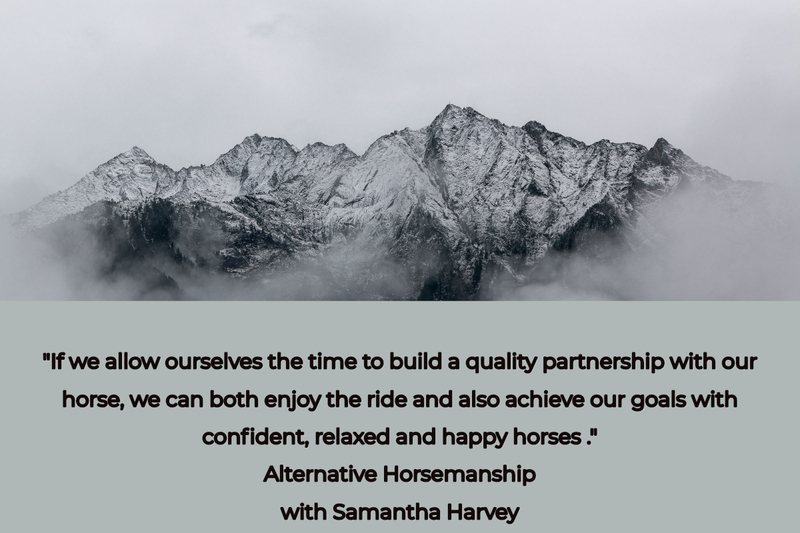 Looking ahead to the upcoming riding season, whether you ride for pleasure or are a competitor, you can strive to offer a supportive partnership towards your horse. I will touch on two concepts that you can start considering, without even having to battle the outdoor winter conditions! The first is addressing your mental focus. Often we think of riding as an escape from the everyday challenges and stresses of life. The horse on the other hand can immediately recognize if the person is not mentally present, if they are distracted, stressed, tired, etc. I suggest folks learn how to mentally “leave reality at the door” when they are heading out to ride. My perspective is that the ride begins when someone thinks about going for the ride. Mentally separating other aspects of life from the time spent with the horse allows a rider to offer the same level of consideration, conversation and focus they are asking from their horse. When mentally present, a person can communicate proactively with their horse, rather than only offering input or critique after the horse has made an undesired movement. When people are distracted, they tend to only notice the big and dramatic moments, rather than the subtle ones when the horse is initially asking for guidance or support. If the human suddenly tries to intervene during peak stress or fear in the horse, it can cause defensiveness towards the rider’s aids. Intentional guidance from the rider (which should not be presented as a dictatorship to the horse), what I call “riding in real time,” increases the clarity and timing towards what the horse is about to offer. This also decreases the critical, after-the-fact interaction that occurs between many humans and horses. A rider’s constant critique is a leading contributor to creating defensive horses. By taking the initiative and offering specific intention, the horse can be clear on what will be asked of him. 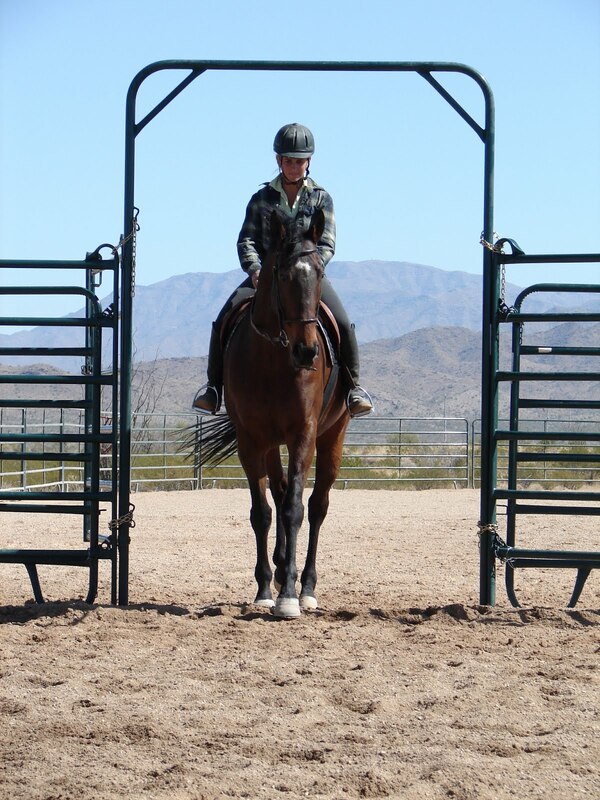 This can build his confidence and increases his willingness to try, because the rider will be offering respectful and specific communication. Addressing your own mental presence leads to my next topic: riding goals, intentions and the horse’s thought. As they say, “hindsight is 20/20.” Take a few minutes and think about the last one or two riding seasons. What were some challenges that arose between you and your horse and have they been addressed? 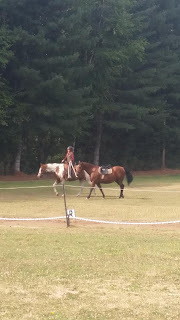 For a lot of folks the traditional “wet saddle blankets” approach is used as a way for horses to learn and improve. I find that solely focusing on the horse’s physical movement leads to a continuous “containment” from the rider trying to keep the horse physically compliant. Instead, I prioritize getting the horse’s thought with me first, which then influences his physical movement. When you think of past experiences with your horse, do you start with “I didn’t want him to…” or “I wish he would not always...” or “I hope we can…”? Those three sentence starters I frequently hear from riders who are having difficulty achieving goals with their horse. 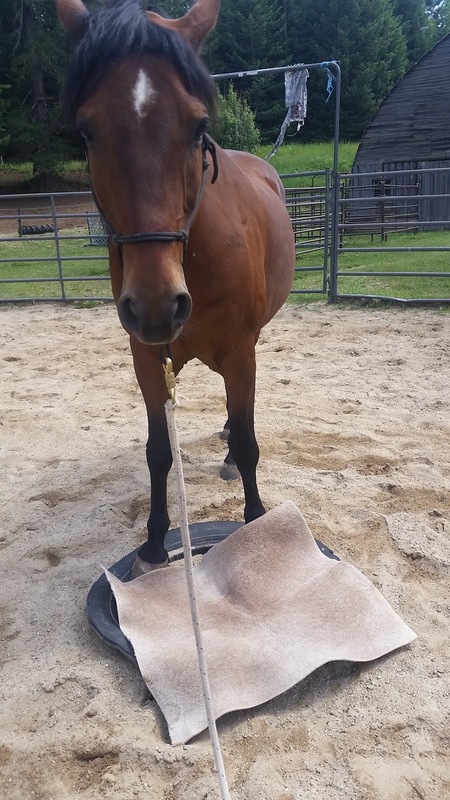 Often people fixate on what they do not want their horse to do, rather than how they can change their approach and help their horse arrive at a different outcome. Imagine someone was a nervous, inexperienced driver and there were bad road conditions. If before they drove their car you told them “Don’t crash,” would that decrease their chance of getting into an accident? Probably not. In fact it might even add stress while they were driving and perhaps increase their anxiety. What if the next time they drive their car, you are a passenger and you say things like, “Don’t go so fast… you slowed too much… stop sooner… why did you change lanes?” Would your words relax, build confidence or reassure the already insecure driver? Did you teach them anything? Have you helped improve their driving ability? Has your presence made driving a better experience for them, inspiring them to invite you along in the future? No, it has not. Instead, you have made them feel worse due to your approach in how you interacted with them, even if your intentions were good. Unintentionally many people create that same experience for their horse. The person wonders why they are not achieving the results in their horse’s performance. If the rider continues offering delayed, critical, task-fixated focus irrelevant of the quality, they are not supporting their horse. 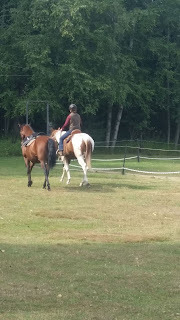 In terms of goals with your own horse, before presenting the back country trail ride, the jump, roping the steer or working on your 20 meter Dressage circle, mentally think through what and how you will need to communicate the small pieces that will contribute to achieving the overall goal. Often through specific, incremental communication from the rider presenting “pieces” of the goal, the horse can better understand the specificity of the movement and build confidence. Below is an example. Let us say you ask your horse to change his energy at the walk, and he ignores you, leaks out with his shoulder, clamps his jaw down on the bit, or stays stuck at one speed. What will happen when you ask him to move faster? Whatever you are feeling at the slower gait will magnify at the faster energy level. If you ignore his initial feedback of resistant and defensive behavior, and attempt to be more specific, such as trying to improve your flying lead changes, roll backs, or finding the ideal spot to the jump, is your horse currently mentally available to hear you? Will his response be to softly address a physical change you ask of him? No. Presenting the long term goal when you are missing the foundation pieces is setting the horse up to fail and be critiqued. So take some time on those cold, dark days and perhaps jot down your equine related goals, and what incremental pieces you’ll need to address with your horse to help you both achieve them with quality. Containment: physically trying to "stop" an unwanted behavior, which is usually the symptom and not the underlying "issue." When a person attempts to block, hold, or "drive" a horse they are addressing the horse's physical movement. The more the person focuses on the unwanted movement, the more they actually are making the scenario deteriorate and feel unable to get a change in their horse. Let's change our approach and start by addressing the horse's brain. This means we have to change from expectation (even negative ones such as "he always...") and demands in our horse, and adjust our focus in how we are presenting scenarios. 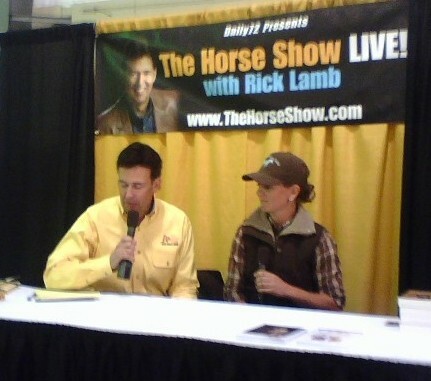 "I hope my horse doesn't spook at the corner. It wrecks the whole ride that follows." This defensive riding sets the horse up to fail and just about guarantees the unwanted movement is going to happen, creating fear in human and horse. 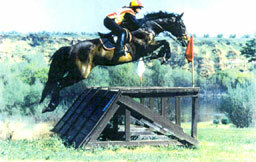 "Several times my horse has spooked at the corner. Before I get to the corner, I need to check in with my horse's brain, emotions and movement. Can I redirect his thought today, or does he seem fixated on each distracting thing happening at the barn. I tried to redirect his brain, but he offered to lean on my rein. Okay, let's pause and ask him to soften to the pressure of the rein. Now he is softer, I'm able to direct where he is looking, but his steps are anticipative and hurried. So now let's work on a few thoughts and then movement to somewhere specific and then pause (could be mental and/or physically) and ask his brain to check in. When his brain checks in, his body offers to slow, he offers to be more present, less anticipative. Now I'm going to have him look towards the direction of pressure (scary corner,) and then look away. Ooops, his feedback with his body was that he wants to look away/move away, so I can't bring him into the vicinity of the scary place yet. I'll help him look and then the moment he shows an interest, I'll draw his thought away from the scary, as the release from the pressure. Oh, now he can look for a longer period without tension rising in his body, let's take a step towards it (pressure on) and now while he's still interested in the corner, let's change the thought and look away (release pressure)... Ah good, he breathed, blew his nose, etc... Let's go do something else for a minute and then we'll come back to this place that feels good now, and gentle expand the comfort zone closer towards the scary corner. You get the idea. There is nothing reactive in how I'd help the horse. Each piece is an opportunity for feedback from the horse, that then "tells" me what aspect I need to address to help him sort thought his bother. This is also NOT repetitiously asking the horse to walk back and forth "desensitizing him" to the corner- that is ALL physical and not mental conversation, and leaves the horse just as bothered. Keep in mind we may or may not make it to the corner today. But the corner isn't the issue. The horse's confidence, mental availability and feeling supported by the rider is. The more he has those three pieces, the more scary corners, horse eating tarps, claustrophobic trailers aren't problems anymore. The conversation between the human and horse should be consistent and clear with the horse coming away less, stressed and more confident for the experience. There is always a special moment, with each horse as our journey progresses, that he will finally allow himself to "hear" me, and then to trust me. For some the experience takes a lot of sorting out of emotions, trial and error, and searching... for other horses you can immediately "feel" their desire to want to meet you on the "other side" of the partnership. Whichever case it may be, there is this fragile, beautiful moment, when the horse will literally look at you with an entirely different expression. The eyes go soft. The breathing slows. The tension and defensiveness leave the body. The steps get light and quiet. And you can "hear" the horse. Everything about the ears, eyes, jaw, muzzle, throat, top-line, stifle, hocks and tail becomes "putty," just waiting for you to "mold" it... He willingly offers his trust that "it" will be okay if he follows your lead. It never gets "old" to be a part of that journey, to see the change, and experience the togetherness... I'm so thankful to the horses, and their owners, who both trust me to guide them to that mentally, emotionally and physically quiet place. Becoming involved with horses is a physical, financial, time consuming, mental and emotional investment. In terms of buying a horse, there is a common notion that because a person can pay the initial purchase price and maintenance fees, they now will have a rewarding experience. But what about the investment in the rider's education? Though there may be an emotional connection with a horse, there is nothing natural about people understanding horses or how to communicate with them, never mind knowing how to ride them. This is a crucial part, a fundamental necessity, that is frequently overlooked in a partnership. Below is my perspective from my personal experiences. I feel that our society somehow doesn't see monetary value in someone's knowledge/experience/skill set, unless they have gone through the mainstream educational system- i.e. law school, medical school, etc. For those occupations, for a limited number of years of schooling, folks can charge anywhere from several hundred to several thousand dollars- AN HOUR. And no, their services are not typically only for one hour, but often many hours and on going consulting, surgeries and trials, etc. After which, whether you survive the surgery, win the trial, etc. you literally winding up "paying for it" for years or even a lifetime. But when it comes to a pleasure sport/hobby/interest- because it is for fun- somehow there is less "value" in the instructor's knowledge. I'm sure there's always some crazy abnormal scenarios, but typically, your yoga instructor, martial arts instructor, dance teacher, tennis pro, golf teacher, etc is going to be charging less than several hundred dollars an hour. Even for those jobs or careers, there are often defined courses, educational programs, etc. to justify the cost of instruction. And then you come to the Equine Industry. I might offend a few folks, but anyone who has real world experience recognizes that for all the University courses offered with equine focused degrees, they aren't worth anything when it comes to getting hired in the horse industry within the USA. That means as an equine instructor/trainer, your value, your experience, your knowledge, skill set, has to be attained, achieved, continued, through creative, unique, self-driven yearning/desire/hunger for "finding" (literally) other equine professionals to teach you. This often includes things like being a working student for years (think slave labor), or if you do find a paying job- very labor intensive jobs with very little direct instruction/pay, inconsistent schedules with no room for a social life/family/financial stability, and many other sacrifices all in the name of becoming a better horse person. 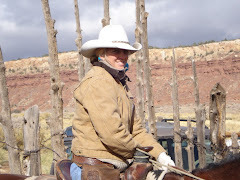 I recently had to write a bio on myself, and as I started listing my experiences from the last 25 years, ranging from riding under Grand Prix jumper and Dressage trainers, working under Olympic Gold Medalists while based in Europe, riding at race tracks, working on ranches starting colts, riding horses on sheep farms in South America, clinicing with some of the best horseman from around the world in a variety of disciplines, riding hundreds of horses I've that have been teachers in themselves, plus the thousands of hours I've spent honing my craft as an instructor, trainer, communicator, clinician, lecturer, and published contributor. So, how do you put a "value" to that? What is my "worth?" In the USA, there is a huge discrepancy depending on location and services offered; I know I can charge double what I charge in remote Idaho if I head to CA or FL or MA. 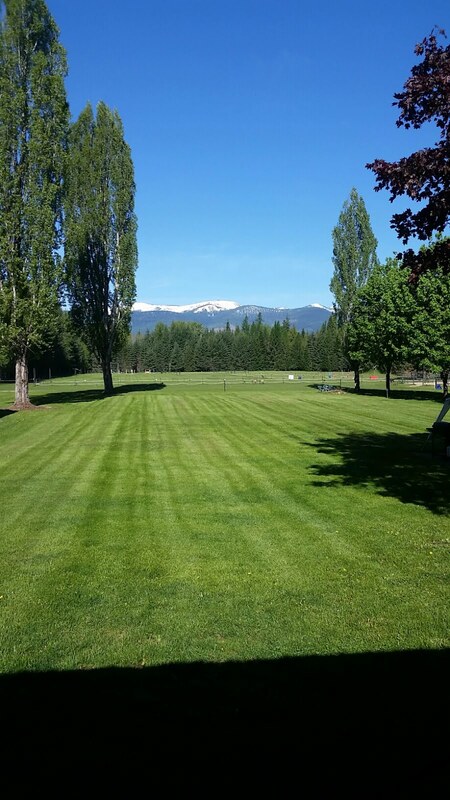 Putting the value of the knowledge shared and taught aside for a moment, what about covering costs for the liability and property insurance for the facility, the maintenance and upkeep of the "gorgeous setting" folks enjoy their lessons in, or maintenance and care for the lesson horses? What about the hundreds of other tasks that require effort, intention, labor, money and energy that there is no direct "payment" for? What about the time-consuming correspondence via email and phone where folks take up your time, often not leading to future income. Web design/upkeep, blog posts, newsletters, accounting, office work, none of which you get paid for. So the next time you find out how much a training session or lesson costs with a quality instructor, pause for a moment. Yes, you may be looking to do horses "just for fun." Please keep in mind the professional you are seeking to learn from has probably sacrificed and lived an unforgiving, unrelenting life full of financial stresses and physical labor, to acquire and hone their skills and abilities to share that with their students. It may be difficult for you to relate to, but perhaps think of it as learning opportunity in a condensed version, without all the personal sacrifice. And by the way, sitting on 1,000 lbs of an emotional, prey animal, being "hopeful" that you will figure it out is not the safest choice. Learning can be a healthy, positive approach that stimulates growth, improvement and solidifies the equine partnership. Even us professionals do not reach an "end point." Every horse, every student is an opportunity for us to improve what we offer the public. End of the week thoughts... Someone was asking about a highly reactive Thoroughbred and how fix his spooking issues, even after he had been at a trainer for two months. Here is my answer: I agree to rule out potential physical issues first. Then let's change your focus. What if the spook wasn't the issue, but the symptom? What if we started assessing the horse from the moment you arrive, and watch his initial mental and emotional state? So many horses are starting a session with a defensive, reactive mental state, and often because they are so stressed on the inside, their brain is far away from their body. Rather than acknowledging or putting value to this, often folks try to make the horse physically move more and faster, thinking this will get the horse's focus. Instead, they're "filling" their horse's cup of what he can handle, until when it is too full, and then "all of a sudden" the horse spooks, explodes, etc. It wasn't all of a sudden. If you slow down and watch, so often even in the most "boring" scenarios the horses are living in a state of constant mental stress, even if they aren't acting big and dramatic. The little bit of hurry in their walk, the busy-ness with their head when standing still, the constant movement or swinging of their hind end when groomed and tacked, the tension in their jaw, neck and back as the saddle is put on, the inability to stand for mounting, the pulling or heaviness on the lead rope or rein, etc. None of those seemingly insignificant unwanted behavioral issues are physical resistance. They each are signals as to the horse's fear, worry, anticipation, etc. When he is bothered on the inside, he'll get physically more dramatic on the outside. And yet, folks are taught to ignore the busy-ness, "oh, they just do that", or reprimand it- lunge, desensitize, etc. What does this teach the horse? When he is having a problem, or is concerned, he either is ignored, or reprimanded and may even have more pressure forced upon him at the moment of his discomfort. So what happens in the future? Each time that horse's cup starts filling, does he look to the human for guidance? No. He "handles it" by getting bigger, faster and increasingly frantic, as he reaches a point of being overwhelmed. I see it ALL the time. Doesn't matter the breed, training, background or discipline. People are "taught" to ignore the horse until they can't. What if you slowed down and addressed the horse's brain first. Help him learn to literally look where he is going (folks are amazed how many horses never literally see what is in front of them due to anticipation), before he moves. Reassess his understanding, his concept of pressure and how you'll communicate with him from the ground. Can you influence his brain, then movement? Does he mentally check in with you or his brain a half mile away from his body? If he isn't mentally able to hear you, and he's defensive towards how you communicate, his stress will continually increase, and the more overwhelming the world becomes, hence the spooking, bolting, fleeing a lot of horses show. 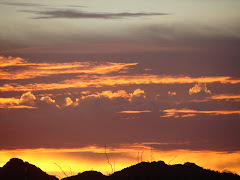 This isn't about repeating something mindlessly over and over, in fact that does two things, either causes them to mental shut down and check out-seemingly fine- until you change something you ask of them and they "suddenly blow up", or you continue putting them in overwhelming scenarios that blow their mind. So perhaps, rather than focusing on the obvious- his movement, start to zero in on the subtle nuances your horse is offering in regards to his mental and emotional state, find a trainer who can help address that, teach you how to have a conversation with the horse, believe the horse when he shows initial concern and learn how to support him thinking through all his worry and bother, and physically the horse will offer to soften, relax and decrease his defensive reactivity- without you "making" him doing anything. This isn't a quick fix. It requires a commitment and mental presence from you, it causes folks to reassess everything they thought they knew about horses. But in the long run you end up with that confident and fun horse and you both enjoy the partnership. Happy 2019! I hope your year is off to a great start. Whether you're familiar with my teaching and training theories and methods are would like to find out more, here's a great opportunity! Even is a bit chilly outside in most of the world right now, grab a cup of something warm, wrap up in a blanket and enjoy this 10 minute TOP 5 Q & A with... ME! Enjoy and feel free to share with your horse friends. Wishing everyone the start of a happy holiday season- let there be many rides through the snow! Looking for the perfect gift for that horse lover? 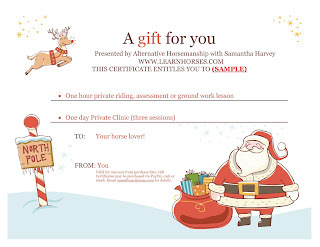 We offer gift certificates for a variety of scenarios. Please message me for details! 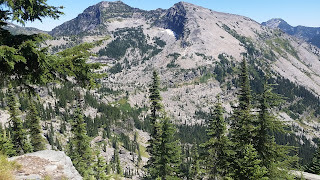 Temps quickly dropped in the Pacific Northwest and summer is over... still enjoying the slightly warmer days now that the smoke has mostly cleared out from a night of rain. The pictures below summarize some of what I do by NOT following trends, disciplines or otherwise... sidepull, ranch roping saddle, helmet, English saddle on ponied horse, Dressage arena, woods?!? They are horses first, then focus on a specific discipline. Clear communication first, then refine the specific task asked of the horse. Someone yesterday asked me to Define what exactly it is that makes it different in what I do compared to everybody else. I'm looking to create mentally available horses, so that they participate in a physically soft and willing manner in all that we may ask of them. Many horses are taught to go through the motions, are taught conditioned responses through endless repetition, but there is a lack of mental presence or willingness. Whether it is a pleasure horse or competitive horse, if the animal is always mentally checked out, how soft will he be towards your aids, how willing will he be to do things that are asked of him, and how quickly will he constantly be looking for an "escape" option if mentally he wants nothing to do with the human? It is an ongoing journey to work towards refining ourselves and creating a partnership with the horse. Let's say you were going to bake a cake. If you did not have all the correct ingredients and the proper measurements of those ingredients, no matter how many times you put the cake mixture in the oven, it would never baked as it should. The end product would never come out as you wanted. And if the only thing you did was keep adjusting the temperature at which you were baking a cake, you would keep getting different unwanted outcomes. But what if instead you went back and checked your ingredients list and realized you had missed something. Even something that seemed minor such as baking powder, and yet had such a massive effect on the rise of the cake, the texture of the cake, you'd realize how such a small amount of said ingredient would have such a big influence on the final outcome of the cake. The same goes for our partnership with our horses. So perhaps the next time you head out to see your horse you might review if you have all the necessary ingredients to create that ideal ride. Ever felt like you were "surviving" the ride? Most riders and horses "go through the motions" and tolerate each other with a sense of "surviving the ride." Instead why not encourage your horse to learn how to offer a "try" rather than a "why should I?" mental attitude. The physical actions your horse displays are a reflection of his mental and emotional state. By treating each horse as an individual and assessing his level of experience, trust, respect and past and we can then work WITH him in order to gain his trust and respect to achieve a quality partnership.